I'm always on the look out for free images for blogs / websites that I can use - like many others who maintain their own (non-commercial) site. With last week's announcement that Getty Images have made available 35m of their vast photo archive available to embed, I've decided to compile my three top resources for free images on the web. My test search for all three is Aberdeen, the Granite city. The daddy of image databases. I've used Flickr for as long as I can remember! Go to the Flickr Advanced Search, and tick ' Only search within Creative Commons-licensed content' after entering your search term (in my case 'Aberdeen'). You can use any image the search returns, provided you include a correct attribution on the blog or site where you use it. There aren't any official Flickr guidelines on how to credit Creative Commons - I myself have used a combination of different methods. It's complicated by the fact that you can either download the image, or embed it directly from Flickr. Here's a good resource outlining all the different ways to correctly credit Flickr Creative Commons images. I'm using the ImageCodr tool to embed directly from Flickr. The tool creates the complete html code (grab it and put into your html). It links to the licence, the image, and credits its author. 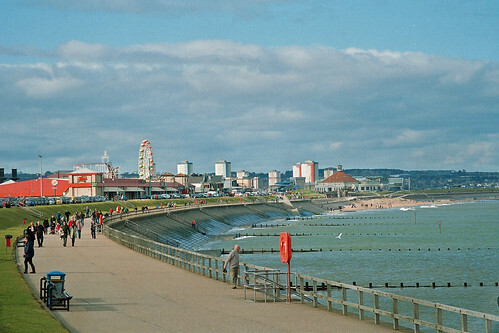 A nice photo of Aberdeen beach! It's been possible to find free images for blogs on Google since 2009 - but not many people (myself included) were aware of it, seeing the option to search by image licence was buried deep in the advanced search. Since January 2014 however they've made it much easier by including 'Usage Rights' in the Images - Search Tools menu (see screenshot below). It's useful to have - Google remains my first destination for any online activity and it's good to be able to quickly search for free images within the search engine results. Type your query into the search bar and switch to the images tab. Click on Search Tools and, from Usage Rights, select Labeled for noncommercial reuse (or one of the other options, depending how you'd like to use the image). A caveat here - finding free photos via Google Images isn't without its problems and critics. That's because sites could be publishing images with a licence for reuse, when they aren't the original owners. This means that you can't necessarily trust the results - Google's Usage rights information isn't verified legally by any external source. I'd recommend to use the Google reverse image search to double check if any image you find with this method is used elsewhere, to confirm its original owner, and to check that the photo's licensing in the Google results is definitely correct. For my test search, I'm playing it safe - I found an image on Wikimedia Commons of His Majesty's Theatre, Aberdeen. The page hosting the image (see link above) helpfully provides information on how to credit it, even supplying the html code if you select 'Use this file on the web'. And that's just what I've done below! Note that the HTML code Wikimedia supplies doesn't include any visible caption or text. Instead, it's all hidden. The author credit and licence link are in the link title, and the image itself links to the page hosting it. The image title is in the image alt text (= good for vertical search results). I had to amend the HTML code supplied by Wikimedia manually as the backlink to the image page didn't work... Also, I added target=_blank as I didn't want to load the original page into the same browser window. Basic HTML knowledge required! A great photo of His Majesty's theatre in Aberdeen. Getty Images is the latest source providing free images for blogs and websites to use. Note that it's not a free for all - only non-commercial entities may embed images from Getty's collection free of charge. So, if you're a B&B or hotel in Aberdeen looking for free photos of the Granite city to use on your blog or website, this isn't an option for you. Not all of Getty's photos are free to use, but its free archive has up to 35m photos so there's plenty to choose from! Start your search here, on the Getty's free image archive. Photos that you use from Getty are "framed" with a code that links back to their website, and the site even has an embed tool to make it all easy!